Ryans was a consensus first-team All-American in 2005 and SEC Defensive Player of the Year. He was chosen by the Texans in the second round of the 2006 NFL draft. An outside linebacker in college, he was moved to middle linebacker by Houston where he became an immediate contributor and outshone first overall pick DE Mario Williams. What Ryans lacked in size and speed he made up with excellent instincts and technique. 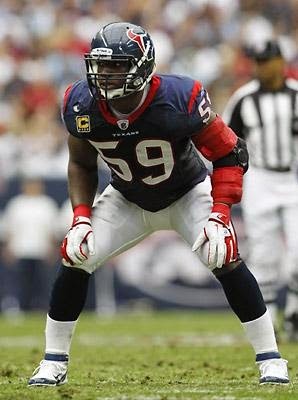 Ryans followed up with a Pro Bowl season in 2007 and established himself as a top player at his position and a leader on the Houston defense. He was a Pro Bowl selection again in 2009 but went down with an Achilles tendon injury six games into the 2010 season and the defense suffered in his absence. Ryans returned to play in every game in 2011 but was less successful playing in a 3-4 defense and was traded to the Philadelphia Eagles in 2012. He continued to be a solid starter in Philadelphia, and while less effective in pass coverage than earlier in his career, Ryans brought savvy and leadership. Through 2013, he had accumulated 13.5 sacks, five interceptions, 667 tackles and 209 assists.